We are honor introducing you a few details on our hotel: Being an international hotel, located in the downtown with historical relic spots, cathedral, the spots, Ben Thanh market and business center. 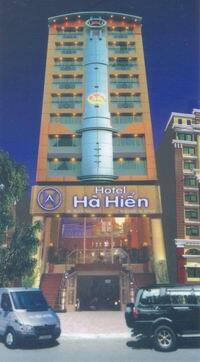 A convenient place for businessmen, travelers, for those making excursion and shopping. Once going to our hotel, you will surely be pleased with services such as: shopping, F&B entertainment and relax. In fact, you will be served by our hotel team comprising devoted, caring and professional staff. The attention to the needs of the guests within the hotel is exceptionally professional. Employees at a hotel make sure to attend to guests every whim. Very night there is live entertainment. There are many styles, such as: Latin, R&B, pop, rock etc. You will be served by our hotel team comprising devoted, caring and professional staff. Internet is provided so that guests can communicate with loved ones, business partners, or for uses of research, etc. The Internet that is provided is ADSL and Wi-fi, which are easy to use and very fast. If visitors need to get airplane tickets all they need to do is let someone in charge of travel in the hotel, the destination desired, and they will receive the help they need. Laundry service is provided for guests, as to make their stay more comfortable. This saves the visitors a lot of time. The restaurants are designed to be luxurious, comfortable, and to have speedy but good service. They serve breakfast, lunch, and dinner. Cuisines served at the restaurants are European and Asian. The main food is specialized from three different regions. They also provide karaoke rooms that can be used for parties, weddings, or conferences. The bar system includes many drinks from different parts of the world. The room service given by the hotel is refined, and convenient. This allows tourists to eat in the comfort of their own room. The staff members are well behaved, polite, and pay close attention to guests needs. Come in as Guest, leave as Family.